On Wednesday, November 24, the Obama administration designated 187,157 square miles (approximately 120 million acres) in Arctic Alaska as a ‘critical habitat’ for polar bears threatened by disappearing sea ice due to climate change. Let us take a moment to give thanks to those who made this significant designation possible—President Obama and the Department of Interior, and three environmental groups: Center for Biological Diversity, the Natural Resources Defense Council and Greenpeace. Those three organizations had filed a lawsuit against the U.S. Department of Interior to protect polar bears and their habitats. Their efforts resulted in success—on May 15, 2008 the Fish and Wildlife Service (FWS), a division of the Department of Interior, listed polar bear as a ‘threatened species’ under the Endangered Species Act. Then, on October 29, 2009 FWS proposed 200,541 square miles in Arctic Alaska to be designated as ‘critical habitat’ for polar bears. Subsequently, existing U.S. Air Force structures, communities of Barrow and Kaktovik, and some territorial waters that were incorrectly estimated were excluded resulting in 187,157 square miles for the final designation. If you are curious about what ‘critical habitat’ means and a map of the designated area you can check out the good information compiled by FWS here. This is a very significant first step toward protecting polar bears and all Arctic marine species, and at the same time bringing much needed attention to the climate change issues affecting the Arctic and all life up there. The designated habitat includes three ecozones—sea ice, barrier islands and onshore denning habitat. Polar bears use these areas for feeding, finding mates, denning and raising cubs. It is their homeland where they make a living and survive. Nearly 95% of this designated habitat is in the sea ice of the Beaufort and Chukchi Seas of Arctic Alaska. Just so it happens Shell wants to go drill for oil in the same place that was just designated critical habitat for polar bears. In the wake of BP’s horrendous oil–and–methane spill in the Gulf of Mexico, on May 25 I wrote an article in which I had urged President Obama to stop Shell from going to the Beaufort and Chukchi Seas. On May 27 the President suspended Shell’s Arctic drilling plan for 2010. But ever since, Shell and the Alaska Congressional delegation have been pressuring him to lift the suspension. Shell for their part launched a massive ad campaign earlier this month. I’m sure somewhere you must have seen the Shell ad “Let’s Go.” I’d say “Let’s” instead make sure Shell doesn’t “Go” anywhere near the polar bear critical habitat. This year the world experienced devastating impacts of climate change—forest fires in Russia, flood in Pakistan, hottest first six months globally since recording began in 1880 ... the list goes on. In the same year, the U.S. Senate killed a climate bill over the summer, and then more climate deniers got elected in the midterm election. Any hope of solving climate change through legislation during the 112th Congress has completely vanished. In light of all these, this recent decision by the Obama administration is very significant, only if the President will also follow through with denying Shell the permit to drill in the same polar bear habitat that he just designated. Access to Food A Fundamental Species Right? In late October 2000, I went with two friends Sanjeeban and Srikant to Churchill, a small town in Manitoba along the Hudson Bay in the Canadian subarctic. Tourists and photographers go there to see and photograph polar bears. Each autumn a fairly large number of bears gather on the tundra near Churchill and wait for Hudson Bay to freeze over so that they can go out onto the ice to hunt and eat again. Each day we would go out on a buggy—large vehicle with very high tires that allows safe viewing and picturing of bears. I came back with some decent photos. 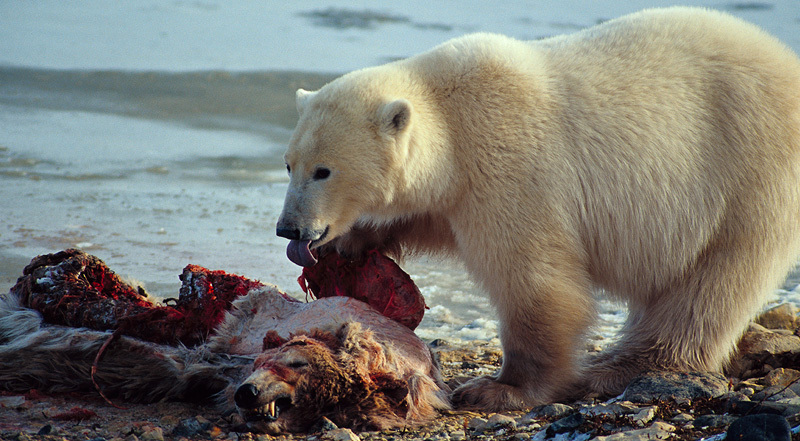 But I also came back with one photograph that has haunted me ever since—one polar bear eating another. I never exhibited or published this photo until now. In it we see a juvenile bear eating a larger bear. The story goes like this as it was told to me by a local guide—in the early morning hours a large bear killed another and ate as much as possible and then departed. When we arrived a smaller bear was eating what was left. I was also told that a large male does occasionally kill small cubs on ice to attract a female to mate, but it is highly unusual that a mature bear would kill another to eat. They’re actually very social animals that like to hang out and play together. Bears do however create problems by coming into the town of Churchill every now and then looking for food—they’re hungry. To protect the residents and tourists from these bears the town has a system where the ‘bear police’ would catch these bears and put them in a ‘polar bear jail’ until the ice freezes, at which point the bear police would transport these bears by helicopter and drop them onto the ice so that the bears can hunt and find food on their own. But in 2000 when I was there no one in Churchill whom I talked to said anything about climate change as a possible problem for the bears or for their town. Scientists however have been studying the Hudson Bay bears quite extensively for decades and here is their story. Due to climate change the ice of Hudson Bay is melting sooner than normal in spring and forming later than normal in autumn, leaving the bears stranded on land much longer than normal and reducing their feeding possibilities. Polar bears are unable to hunt on land. They’re only able to hunt on ice. They starve while onshore, and in recent years when there has been very little ice they’ve starved for five months straight. Earlier this year Yale Environment 360 published an interview with biologist Andrew Derocher of University of Alberta who has been studying the Hudson Bay bears extensively with his colleagues. Title of the interview is “For Hudson Bay Polar Bears, The End is Already in Sight.” In a paper published in Biological Conservation Derocher and his colleagues estimated that “western Hudson Bay’s polar bear population could well die out in 25 to 30 years” and in the Yale Environment 360 interview he stated these bears “could be gone within a decade” if there are a few consecutive years of low sea ice conditions. Those Churchill bears while onshore for months each year are starving and I doubt they’re sleeping either, probably just dozing off while starving, will perish in my lifetime. This is my way of saying that eating and sleeping have a lot to do with survival. On July 28 the United Nations declared ‘Water a Fundamental Human Right.’ It was a historic vote at the UN—122 countries voted in favor of the resolution, more than 40 countries abstained including U. S., Canada and several industrialized countries. No country voted against the resolution. If you’re curious why did U. S. and Canada abstain from voting for such a basic right to survival, particularly when the lead water activist Maude Barlow is Canadian? Corporations have huge influence on our governments and giving someone else the right to have clean–free–water could affect their right to have dirty–huge–profits. Henry Thoreau began his essay Walking with these words, “I wish to speak a word for Nature, for absolute freedom and wildness, as contrasted with a freedom and culture merely civil—to regard man as an inhabitant, or a part and parcel of Nature, rather than a member of society. I wish to make an extreme statement, if so I may make an emphatic one, for there are enough champions of civilization: the minister and the school committee and every one of you will take care of that.” In the essay he goes on to talking about other species. I’ve carried that essay in my mind for a long time, but this year it has taken on particular significance. Earlier this year the UN announced that the world’s governments failed to honor commitments they made eight years ago about reducing biodiversity loss. Our planet is currently experiencing the greatest rate of species extinction ever. Humans—that’s us—are driving these species to extinction by taking away their food and home. But we can also be the stewards and reduce the extinction rate and perhaps turn things around. The polar bear critical habitat designation is very significant, because first and foremost it acknowledges that other species also have the right to survive on this planet. Following year Robert and I camped on the Canning River delta along the Beaufort Sea coast in the Arctic National Wildlife Refuge for 29 days to observe a polar bear den. We did see once the mother bear and her two cubs play near the den. But during that whole time we had only four calm days, rest of the time blizzard blew steady with peak speed of 65 miles per hour and temperature hovered around minus 45 degrees F with wind–chill dropping to minus 120 degrees F. Can you imagine in such a climate anyone doing a clean–up operation after a major oil spill like the one we had earlier this year in the Gulf of Mexico? Arctic Refuge coastal plain along the Beaufort Sea coast is the only land conservation area in the U.S. for denning polar bears. Unlike grizzly or black bears that require a real den on a hillside, polar bears on the other hand build their dens in temporary snow banks onshore or on sea ice offshore. When summer arrives there’ll be no trace that there was even a den onshore, except perhaps their poop. Pregnant females go in these temporary dens in October–November, give birth during December–January and nurse their cubs inside the den until March–April at which point they emerge from the dens with usually one or two cubs. At that time, the mother has not eaten for five to seven months and they critically require good spring ice for seal hunting to feed themselves and to nurse their cubs. So how many polar bears make their home in the Beaufort and Chukchi Seas? Best estimate is that about 1,600 bears roam the Beaufort Sea of U.S. and Canada, and about 2,000 to 3,000 bears roam the Chukchi Sea of U.S. and Russia. If Shell is given the permit to drill in the Beaufort and Chukchi Seas there is no doubt they’ll impact the bears during their denning time. If disturbed a pregnant female bear would just abandon a den. But more importantly think about their food—bearded and ringed seals that are in abundance in those seas. Those seals eat fish and the fish eats smaller creatures going all the way down to nearly invisible plankton. A major spill from Shell’s drilling operation would cause havoc on the food chain from the very bottom to the very top predator—polar bears. Last thing we would want is to stress these bears further by sending Shell up there to drill for oil. Will President Obama Deny Shell the Arctic Drilling Permit? After the critical habitat designation was announced, Alaska Governor Sean Parnell (Republican) was quick to express his disappointment saying that, “This additional layer of regulatory burden will not only slow job creation and economic growth here and for our nation, but will also slow oil and gas exploration efforts.” This is an argument that has been recycled again and again. In reality we’ll create far more jobs and support our energy needs through domestic investment in clean energy, conservation and sustainable living, and not by allowing dangerous oil drilling that would destroy the Arctic habitat. And speaking of dangerous drilling, earlier this month the Pew Environment Group released a detailed report that explains why the government and the industry do not have adequate abilities to deal with a blowout and spill in the Arctic Seas. We must also place Shell’s Arctic drilling plan in the larger dialog of climate change and the need to transition away from fossil fuels to clean energy. I think after the midterm election we entered a defensive phase in the climate change campaign, meaning we need to protect our goalpost from the dirty energy opponents—Arctic oilers, mountaintop coalers, tar sanders, gas frackers—from scoring goals after goals. And the climate campaign is perhaps transforming for now from being a ‘global’ thing to a ‘very local’ thing where the priority is to protect the health of a community—human and ecological—from irresponsible and destructive fossil fuel projects. This is certainly expressed in the voice of Inupiat community members who are concerned that Shell’s Arctic drilling will destroy their homeland and culture. Between the time President Obama suspended Shell’s drilling plan in late May and now, the only things that have changed are: Shell has spent a lot of money in ad campaign, Alaska Congressional delegations have revved up their rhetoric of job-and-economy, and the Arctic has gotten perhaps just a tad bit warmer—but the fact remains as Robert Thompson always says, “no one knows how to clean up an oil spill underneath the Arctic ice.” So the question remains—will the President deny–or–grant Shell the permit to go drill–and–destroy the critical habitat of polar bears that he just designated? Let us hope he will do the right thing.